The Queen of Wands reversed can indicate a woman who is very helpful and kind. She may be you, or she may stand in for a woman in your life who is older than you, has hair on the lighter end of the spectrum, and who is considered to be a very supportive, giving person. The Queen of Wands, reversed or upright, represents fertility in all its forms. Work: When the reversed Queen of Wands appears in a reading about work, there may shortly be frustrating obstacles and delays that you will be up against. It’s important to not take these personally; just work through them one moment at a time. There may be an older, light haired woman in the workplace (or who is in the position of hiring, if you are looking for work) who is throwing up obstacles. Don’t get frustrated about it, just show her the rational reasons why she needs to do things your way (or hire you.) Do this and you could be more successful than you imagine. Love: With regard to love, an older, light-haired woman could be involved indirectly in your relationship. If she is your “mother in law,” do your best to make her an ally, regardless of how you feel about her. If you are looking for love, you could well meet a very interesting potential partner through an older woman. Let the women in your life know if you are looking to meet someone new. 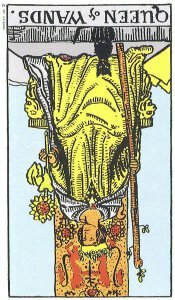 Finances: As with the upright meaning, the reversed Queen of Wands can carry a tendency to overdo it with regards to expenditures. There’s a reason why people say “money can’t buy happiness.” At the same time, there’s no need for you to go to the other extreme and refuse to spend any money whatsoever, or nickel and dime everything and everyone. Moderation is the key to use your finances well and to let them enrich your life and the lives of others. Health: The Queen of Wands reversed generally refers to strong basic health and a positive basic underlying health status. If you are not feeling well, a female health care practitioner may have very important and helpful advice for you. The Queen of Wands is generally linked to fertility; however if you draw this card in the context of having been trying to conceive a child without success, it shows that you should not give up but that the time may have come to seek outside counsel, as in seeing your doctor and discussing your concerns and efforts. Try to relax. Spirituality: A convincing, and perhaps domineering, older woman may try to convince you that she has all or many of the answers when it comes to spirituality. You may need to draw boundaries with her several times, in order to not be pulled into something that works for her but which you have no interest in. She may be angry or hurt as a result, but remember that no one has the right to tell you how to live your spiritual life. It’s important to think and experience for yourself.